The ultimate heavy duty bumper plates. Only from ROGUE. Set includes a pair each of 10,15, 25, and 45lb bumpers. Set includes a pair each of 25,35 and 45lb bumpers. Set includes a pair each of 10, 25, 35, and 45lb bumpers. Set includes a pair each of 10, 15, 25, 35, and 45lb bumpers. Set includes a pair each of 10, 15, 25, 35, and four 45lb single bumpers. Choose your breakdown that is less than or equal to 500lbs. You may note your breakdown in the comments box during checkout. Choose your breakdown that is less than or equal to 1000lbs. You may note your breakdown in the comments box during checkout. Manufactured for more than a decade at the Hi-Temp plant in Tuscumbia, Alabama, Rogue Bumper Plates remain among the few American-made weightlifting plates on the market. By no coincidence, they also rank among the very best—vouched for by trainers, gym owners, and competitive lifters, alike. Finding a much needed alternative to the damaging clang of old-school iron plates and the weak construction of some imported bumpers, Hi-Temps are built from a nearly indestructible marriage of recycled vulcanized rubber and a 2" stainless steel insert. As with most crumb rubber plates, this manufacturing process can sometimes create minor aesthetic imperfections, but quality plates should be all about performance, not winning beauty pageants. As another key design component, the collar on Hi-Temp bumpers is inset from the plane of the plate, allowing for better protection when multiple plates are on the bar, and reducing the risk of inserts getting impacted or popping out. Rogue Hi-Temp Bumpers measure 445MM in diameter and are guaranteed within +/- 0.5LB of the claimed weight. Using the column on the right, you can order your plates in simple pairs (10LB, 15LB, 25LB, 35LB, or 45LB) or in one of our full set options, ranging from 160LB in combined weight to 1,000LB. 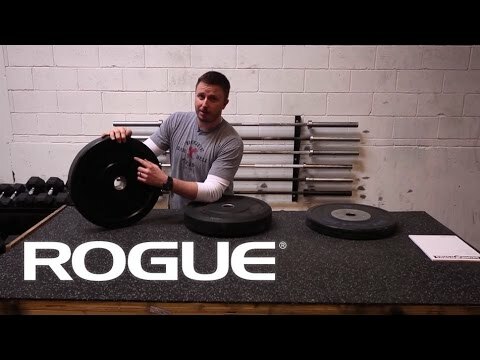 Rogue Bumper Plates by Hi-Temp is rated 4.7 out of 5 by 149. Rated 5 out of 5 by Hal L from Elders, keep going. My quarter-ton deadlifts are 40 years behind me. But the lighter bumper plates allow me to continue with Olympic and power lifts. This is my training partner's first time handling a barbell, starting a few years back at 70+: She qualifies, with me, for the Nationals... a major spirit-lift to past-prime bodies. If you're dis-spirited over fading strength with the iron, try rubber. These are the best of the several plates - different companies - purchased and tried.. Rated 4 out of 5 by ASkreen from Daily driver "do everything well" plates I have been using my Hi-Temps for about 5 years now and I've had no issues. I use them both inside and outside and they show no signs of wearing out. They aren't too loud or bouncy, which is an issue you will run into with other bumper plates. This is especially important in a garage gym setting or anywhere other than a commercial gym. The only downside I see is that the plates aren't 450mm like competition plates or HGs, so it gets complicated to mix them on the same bar. Rated 5 out of 5 by cmm57 from bullet proof bumpers great bumper plates, durable and fairly quiet when dropped for a bumper. Rated 5 out of 5 by Billldo from Nice plates great price These are a great value. They aren't the top of the line aesthetic and uniform but they look nice and tthey are WAAAY nicer than the body solid bumpers I am replacing with these. Shipping is quick. would recommend. Rated 5 out of 5 by Frag from Excellent set I bought the 260lb set to start out my basement gym. I work out on very thin carpet right over bare concrete. These have a decent bounce and thud hitting the floor. They're pretty enough for me and plenty easy enough to use. Rated 4 out of 5 by Lyon heart from Not too shabby Nothing like having your own setup, can always work on my form when the urge strikes. Rated 5 out of 5 by walker6168 from The peak of bumper plates You can't top these things. No worries about rust, no worries about cracking my garage floor, smooth to handle and easy to store.